With Mother’s Day behind us, it’s time to think about Father’s Day … and what to get for the guy in your life! 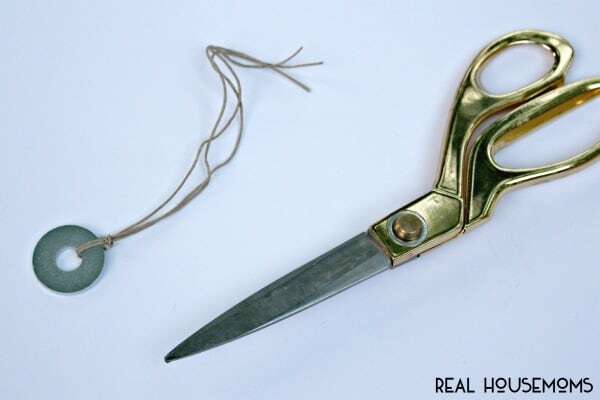 Whether it be your Dad … your Grandpa … the father of your kids … a ‘Dad-like’ figure in your life … or even your son who is now a father, it’s sometimes tough to think of something fun for Father’s Day (or at least I have a hard time with it …). 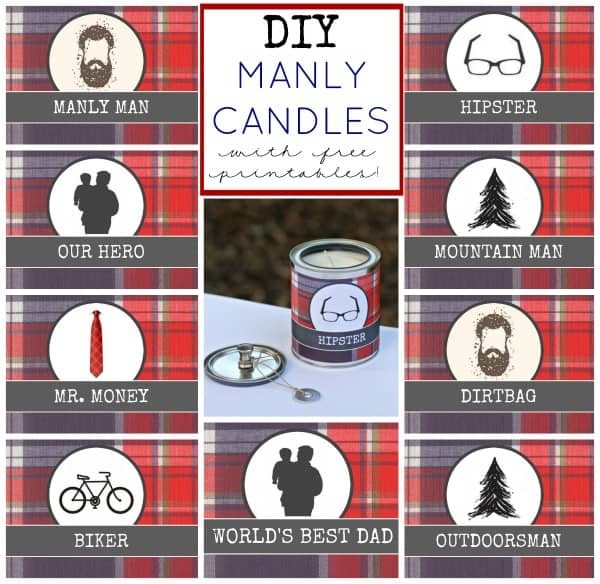 Well, this year I’ve got an idea … how about a manly candle?!? I know what you’re thinking … “no guy wants a candle”, right?. 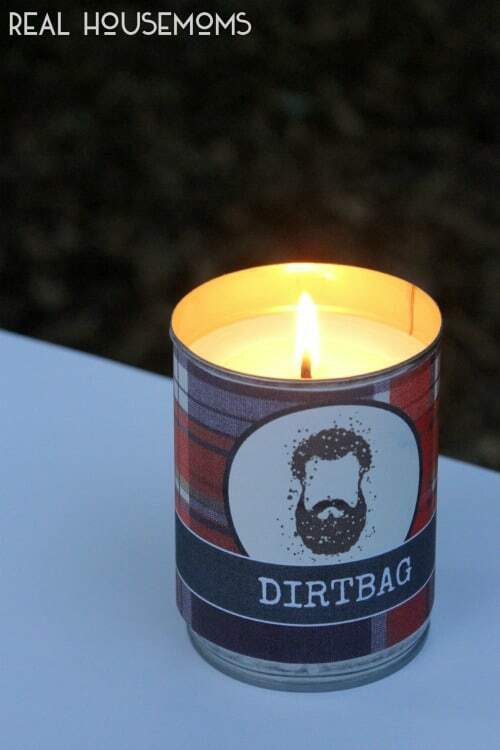 Well … how about if you could make it smell manly? 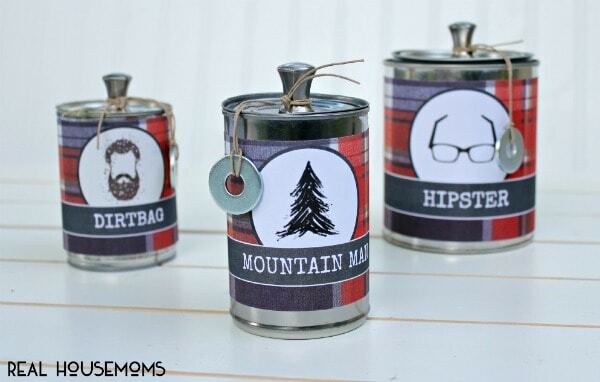 Like woods-y, outdoors-y, and earth-y? And then slap on a custom label that fits your guy’s personality? Just maybe a little more fun and appealing that way? 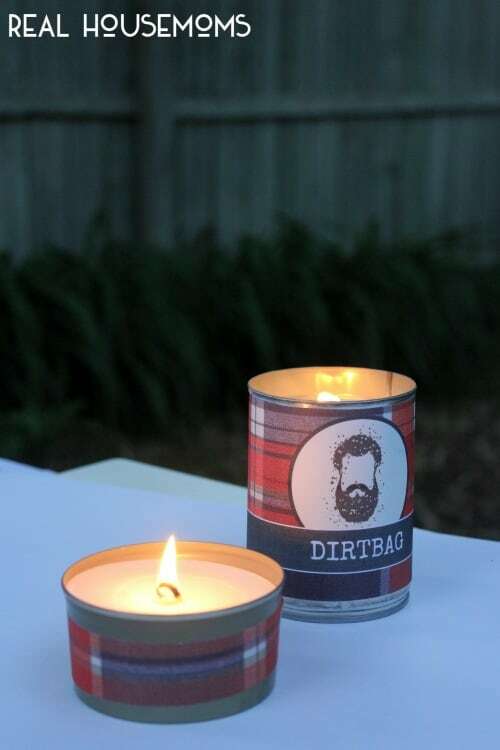 Today I’m sharing an easy tutorial to make-your-own candle (with upcycled, manly supplies) and make it smell like a tough guy. I’ve even got 10 custom printables for you to pick from depending on the recipient … and his personality. Soy Wax Pellets (get them on Amazon or any craft store). 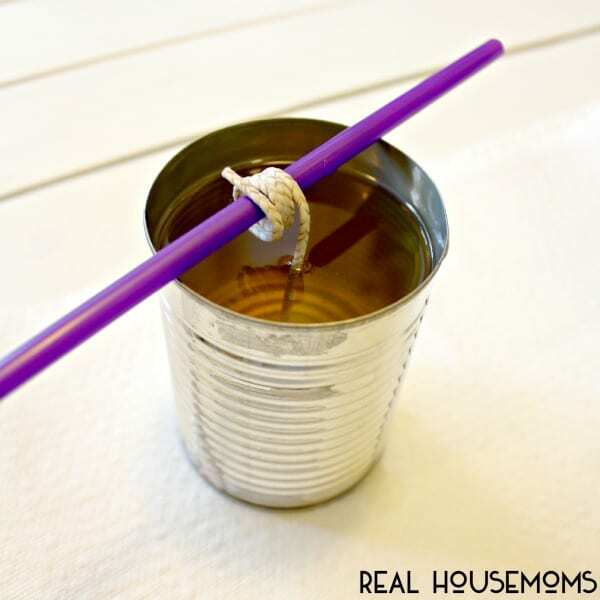 You’ll need about 4 cups to fill a 15 oz tin can, and about 7-8 cups of flakes to fill a quart container. Metal bowl to melt wax in. 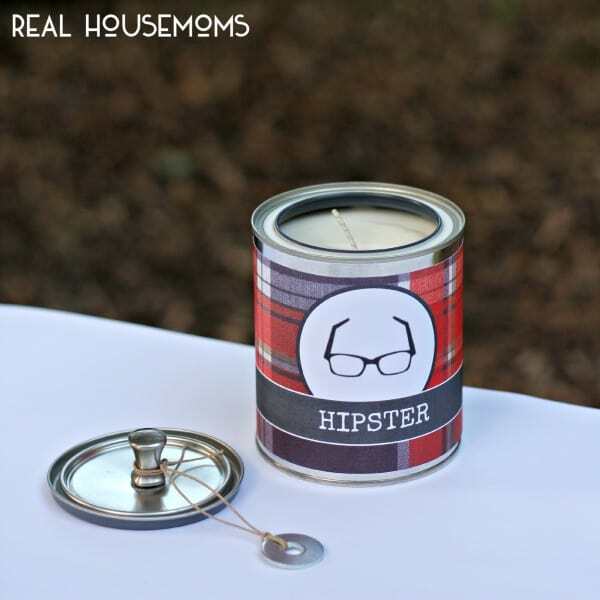 Wick (purchase at any craft store and make sure it fits the corresponding diameter of your can … the package will tell you). 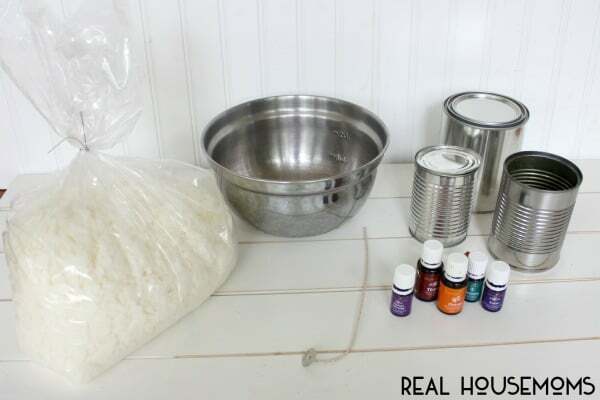 Essential Oils for fragranece (see recommendations below). 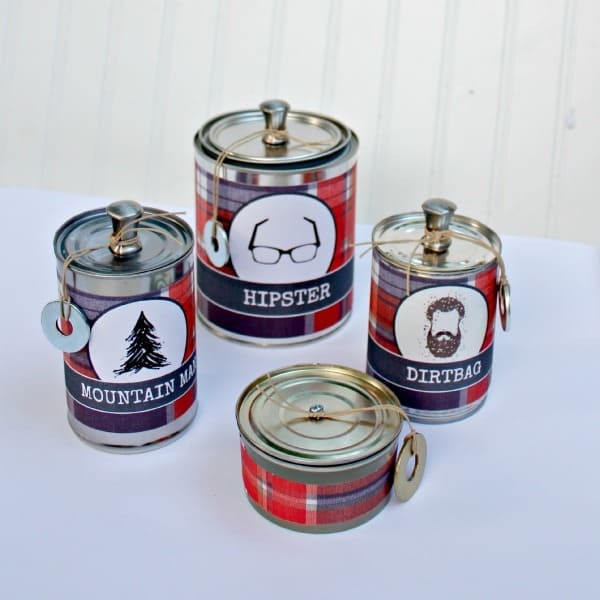 Cans WITH LIDS, too (don’t toss ’em)! 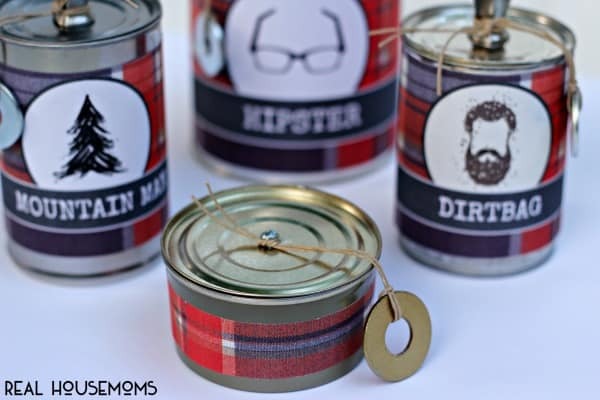 I used several sizes of empty tin cans, one tuna can, and an empty quart size metal paint can from Lowe’s. STEP 1: Place wax pellets into bowl, place bowl in pot of boiling water, and wait for wax to melt. For these candles, I used Thieves Essential Oil Blend (it smells like cloves, cinnamon, …. and cleanliness). I also used Cedarwood in another, and a combination of Pine and Orange in another. 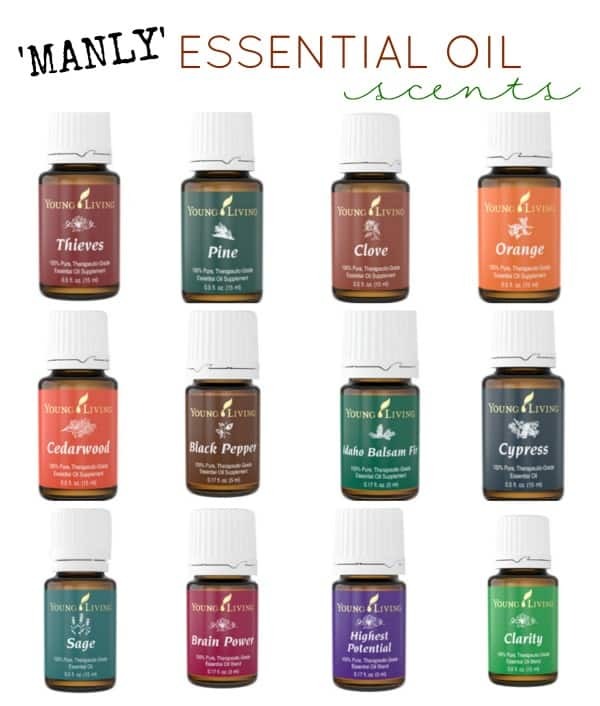 I love using these Essential Oils, but there are also some great fragrance options at craft stores. 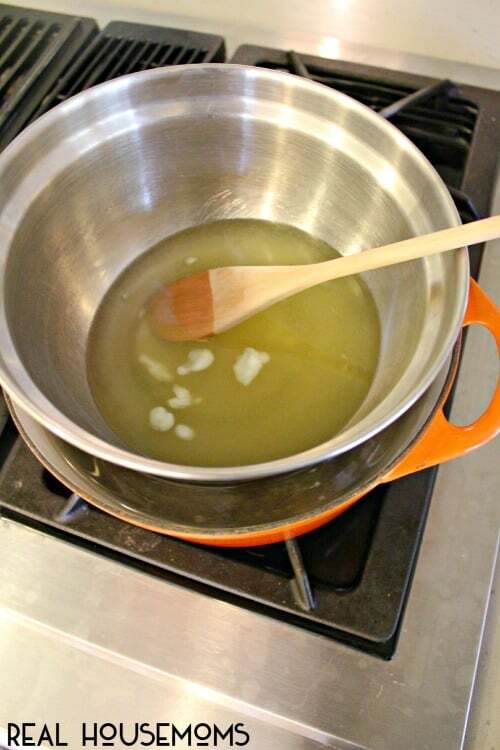 STEP 5: Let wax cool for a couple hours (wax will become opaque when cooled). 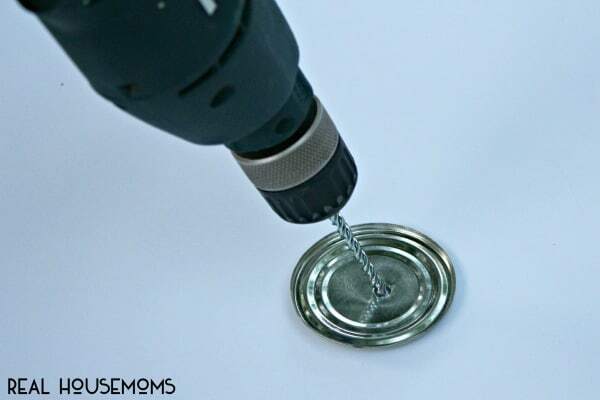 STEP 7: Using small screw, attach knob to top of can top. 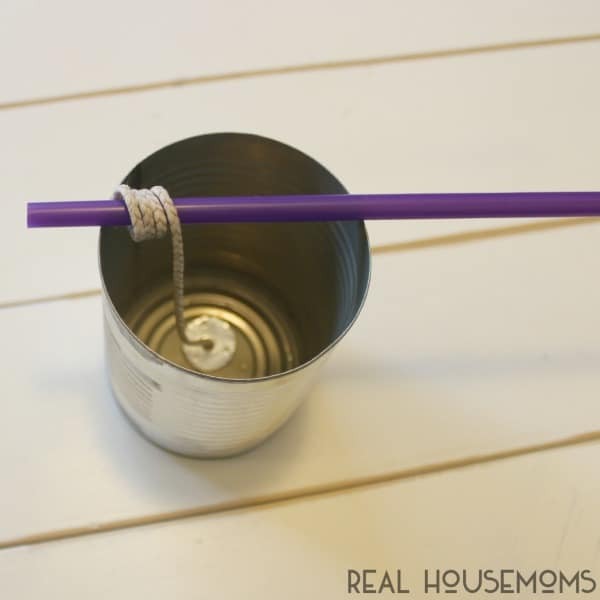 STEP 8: Grab twine, string, ribbon, or baker’s twine and tie a washer onto the knob (this is totally optional, and just for a fun decoration). 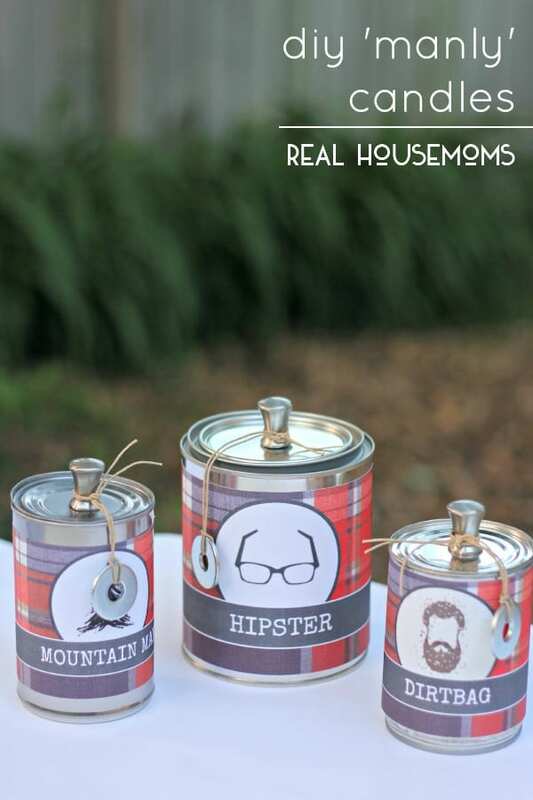 STEP 9: Print, cut out, and adhere label to can (download templates below). I used spray adhesive to secure place the labels onto the cans. 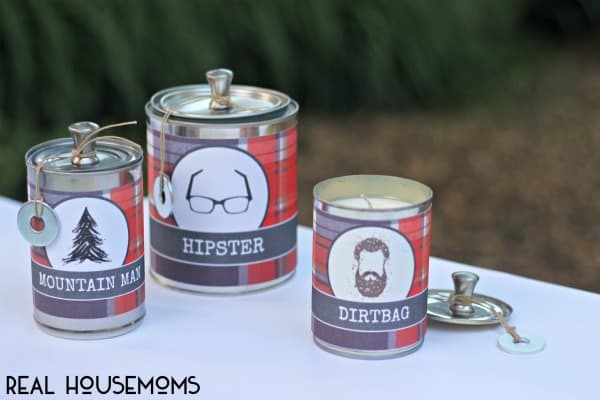 Now … I realize that giving your Dad or your hubby a ‘dirtbag’ candle might not be taken so well. To other dads out there, however … ‘Dirtbag’ might just be a compliment! We do have 9 other options to pick from, however. From the ‘Biker’ to ‘Mr. Money’ to the ‘Outdoorsman’, we’ve got you covered! And … if you’re just looking for a sweet Father’s Day gift, how about ‘World’s Best Dad’ or ‘Our Hero’. You can download these 10 labels for the 15 oz cans HERE (and print just the page you want/need). You can download these 10 labels for the quart size empty paint cans HERE (and again, just print the page you need). 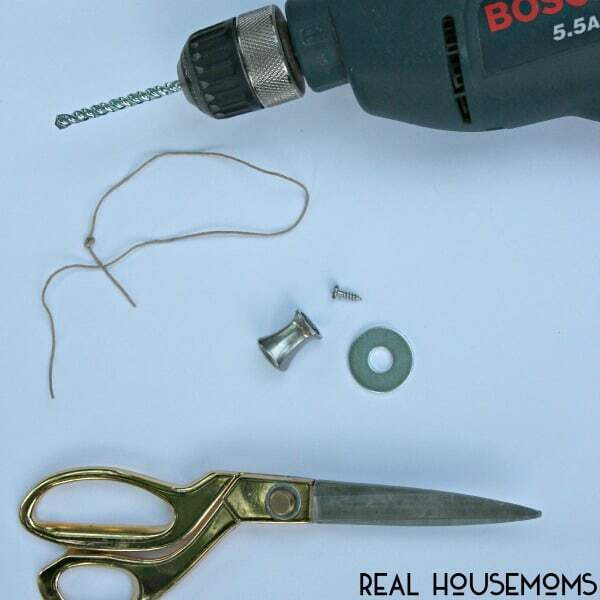 Get more great ides like this one on our Real Housemoms DIY & More pin board! Thanks for having me here today! I’d just love for you to pop on over to View From The Fridge, see what we’re up to lately, and say ‘hello’.